Dr Richard Beeching has become one of the villains of British history for dismantling the railway network in the 1960s. But, Ian Hislop asks, how much did he really change Britain? In lists of the worst Britons, a physicist from the Isle of Sheppey commonly ranks alongside Richard III, Robert Maxwell and Fred West. Dr Richard Beeching's crime was to cut 5,000 miles of railway as boss of British Railways, and his sentence is having his surname as a byword for the senseless axing of public services. 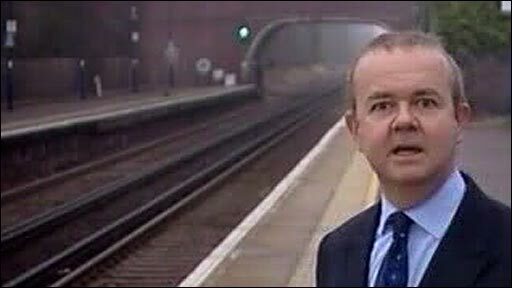 Self-confessed train enthusiast Ian Hislop - an affection that turns to loathing on his daily commute from Kent - says Beeching had a huge impact on Britain. "It marked the end of our romance with the train, the end of public transport and the rise of the car." 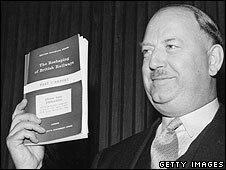 With a business background at ICI and no experience in the rail industry, Beeching was appointed in 1961 by Harold MacMillan's government to take charge of an ailing network, in decline since the early 20th Century and indebted to the tune of £136m. His £24,000 salary was attacked on newspaper front pages but he confidently claimed he could make the railways pay for themselves. Two years later he published his report, The Reshaping of British Railways. It called for the closure of more than a third of the country's 7,000 railway stations and the uprooting of 5,000 miles of track, saving £18m a year. An outcry followed, with demonstrations, petitions and protests at Downing Street, with poet John Betjeman at the vanguard of opposition. Beeching was lampooned in Private Eye with his arms and legs cut off. But Transport Minister Ernest Marples, himself a road builder, remained unmoved. Over the next 10 years, many of his proposed cuts were made, leaving ghost lines and phantom platforms across the UK. The British landscape was forever changed, thousands of jobs were lost and the railways never paid their way. "There are a lot of people that hate him," says Hislop. "Not just people who were put out of work on the railways or had local lines closed, but people who see his model being applied to local hospitals or other not particularly cost efficient public services that come up against the bean-crushers. He was the first of those sort of accountants." Huge swathes of the country were suddenly cut off, including a large part of Cornwall, where people still link the Beeching closures to the economic troubles that plagued the county in the decades that followed. Suddenly the means by which huge numbers of working class holidaymakers visited Cornwall's northern coastline was gone, the fishing industry suffered and agricultural produce could no longer be transported so easily. Boo-hiss, case closed, verdict guilty. Or is it that simple? Hislop concedes some lines had to close and Beeching did some good by being the first person to address the chronic problems facing a network that had been in decline for 50 years. The lorry had taken a lot of the freight business, and while British steam trains were breaking speed records in the 1930s, other countries were investing in diesel and electric technology. After a botched attempt at modernising the network in the 50s, the state of the railways was the subject of the kind of grumbling familiar to travellers today. 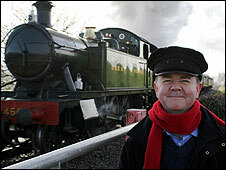 "There is wonderful footage of people complaining in the 60s about the trains being dirty," says Hislop. "We are great at nostalgia and sometimes we need a shaft of light to expose what's wrong. "The growth of the railways is a brilliant story, but it's a story of anarchy, chaos and duplication and it was unplanned in every sense, which gave rise to a lot of problems. Soon after the start of the 20th Century, they fell into decline. 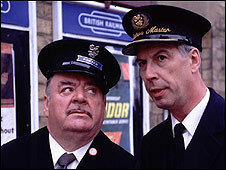 "When Beeching came along there was huge debt and he was there to solve the debt and save money. He did that, but the question was how much he did and how it was administered." Hislop thinks history has been a little unkind to Beeching, not least because it's forgotten that he proposed a much better bus service but ministers never delivered. And in a way, he did their dirty work for them. "He was very useful to politicians," says Hislop. "We think that bringing in someone from industry to dismantle a public service is a new idea but it's not, it was done very well in the 60s." Labour leader Harold Wilson pledged to halt the major closures but when he came to power he realised he could not afford to. And the nation's love affair with the motor car was blossoming. Despite the political failures, Beeching can only blame himself for being so utterly convinced he was right and closing his ears to dissent. "He was a technocrat and wasn't open to argument to romantic notions of rural England or the warp and weft of the train in our national identity. He didn't buy any of that. "He went for a straightforward profit and loss approach and some claim we are still reeling from that today." Where Beeching only saw balance sheets, Betjeman like many artists saw romance and regarded railways as part of the British landscape. "From [painter JMW] Turner onwards, trains are part of what we defined ourselves as, and no-one has really waxed lyrical about a motorway," says Hislop. But as road congestion worsens, so demand for rail travel has rocketed to record levels. So in a final twist, some of Beeching's ghost lines, such as Waverley linking Edinburgh to the Scottish Borders, are being reopened at great cost. The beleaguered rail traveller could yet have his revenge. Beeching used a perverse form of accounting to determine if lines were profitable or not. Passengers and freight were only counted if they started and ended their journey on the same line. Anybody or anything using that line to get to somewhere else (for example, a branch line to a mainline) were not included so many feeder or secondary lines that were determined to be "unprofitable" in fact generated profits elsewhere in the system, but were nonetheless closed and demolished. The net effect was that mainline traffic volumes, especially freight, fell sharply as users were driven off the rails and onto the roads, British Rail did not recover financially and now we are all paying the price with overcrowded and polluting roads and equal overcrowding on what's left of the rail system. We shouldn't hate Beeching, however, as he simply did what his political masters (Tory and then Labour - yes the cuts continued under pro-motorway Wilson) demanded. Looking forward to the programme. I have walked along several stretches of abandoned railway most notably the lovely public walkways that they now form in Barnstable, North Devon and the stretches near Okehampton but also the strange single lines that existed in Kent near Gravesend. Oh how we could do with some of these lines returning, removing the lorries from our roads. Indeed, with the resurgence of the tram perhaps our rural communities that have an old line nearby could reap the benefit of trams and short formed, quiet goods trains. The Beeching cuts were bad enough but destroying the permanent way and selling parts off was another short sighted policy and makes the re-openings much more difficult and expensive. Compare this with Ireland where closed lines are mothballed so the line from Ennis to Sligo can be re-opened in stages. In Lincolnshire, a county many people couldn't place on a map, virtually all the rail network was removed leading to the isolation of hundreds of villages. Beeching is a dirty word in this county. It's a shame that Dr Beeching isn't around to answer his critics. I agree that some of the lines had to close, but we still haven't learnt the lesson demonstrated by many European countries - run for profit railways don't work. Some of the intercity lines have enough traffic to be profitable, but many rural lines will never be profitable but are still crucial and must be supported. Other expansions are proposed alongside Waverley that will utilise disused lines; as an example there is talk of Chiltern Railways extending their line from Aylesbury across to Milton Keynes via Bletchley which will connect with intercity services. The railway rot started before Beeching's over-zealous and one dimensional accountants approach: the billions that were handed out by the US to the UK and Europe after the war was used to rebuild the railways in every country barring the UK, which spent it instead on roads. The evidence of this is still very clear today. After all, you can tax individual road users about five times per car journey but you can't tax a train load of passengers with the same ruthless efficiency. Beeching was simply brought in to finish off the governments dirty work and no, the country has never recovered. A wonderful, informative piece. I recently took a holiday in North Devon, which also got badly hit by the closures at the time. One wonders how Duplicity Brown will figure out new ways to tax these new stations..
One of the local lines from Manchester to Warrington was closed by him and had it remained open or usable today it could have been turned into an extension of the Manchester tram system taking 000's of cars a day off the M6/M62 commuter runs. All in all he deserves his vilification in my opinion as he scrapped a scarce resource in this country that is costing us all dear today. The only "good" of the cuts was the availability of trackbeds for enthusiasts to buy and then restore for use as "heritage railways" with the soon to be disposed of steam locos. This commentary overlooks some of the positive things that arose on British Railways from the Beeching era. In freight, he started the introduction of merry-go-round coal trains for the fast movement of coal to a new generation of power stations - a technique still in use today - and moved the railways into the high capacity container business - now the mainstay of rail freight, carrying a very substantial proportion of our imports and exports with the minimum of fuss. And by concentrating traffic on key trunk routes he made it possible to begin large-scale main line electrification outside commuter areas. The irony was of course that on retirement, Dr. Beeching moved to East Grinstead in Sussex. Three out of four of the railway lines which used to run from East Grinstead were axed following his recommendations. One of them is used today as a relief road - named, appropriately, Beeching Way. I live alongside a disused railway line that now links three of the biggest dormitory communities that serve Newcastle upon Tyne. Every weekday several miles of queuing cars sit alongside the course of the railway. If the line were reopened tomorrow it would more than pay for itself as the thousands of stranded motorists opted for the train, to read the paper and save the outrageous parking charges in the city centre. Beeching was only the thin end of a large wedge that is still being driven between industry and profit. Thatcher carried on what Macmillan's luddites started, it's been government policy ever since. Our latest trains are built in Bruges, our once extensive rail engineering infrastructure is merely a service industry. De-nationalisation of any industry including British Rail is just a convenient way for governments to absolve themselves of responsibility for poor management. As has been alluded to above, some form of major rationalisation of the railways was necessary due to the unplanned and haphazard way the lines were built. The biggest crime was the way it was done, the line closed on one day and the demolition gangs moved in the next, just to make sure the line stayed closed in case anyone wanted to get the line running again as a private or preserved railway. Yes the steam engines had to go as did the ridiculous duplication of routes but it was the spiteful way that local communities were isolated as a result; that is the true legacy of Dr Beeching. I live 12 miles out of Bristol and drive in every day. If the railway from Bristol to Midsomer Norton via Clutton still was still in place, I would happily leave the car at home. The local buses to Bristol are at the wrong times and drop off miles away from my work location. I would take my bike on the train and ride the last mile or two from the station. My father worked on British Rail at the time of Beeching's dismantling of the railways in fact he took demolished some of the small stations around Leicestershire. He said that what Mr Beeching did would come back to haunt this country and in some ways he was right, there are far too many cars on the roads. It will only get worse as where these railway lines used to be there are now houses or such like. No going back in some areas, no forward thinking that's for sure. One of the worst line closures was the Great Central Line, from Marylebone in London to Manchester, because this was built in the expectation of the Channel Tunnel being built. Its bridges and tunnels were therefore designed to take vehicles of continental size, larger than the British size. If that line had remained open, it would have allowed continental freight to travel up to the north of England. This can't be done on the present West Coast or East Coast or Midland main lines. 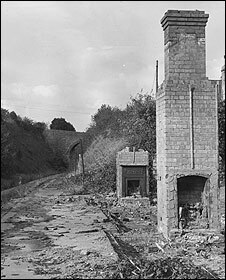 Beeching's greatest crime was to allow the axed infrastructure to be sold off so that stations like Wellington (Somerset) can never be re-opened. Why do we British like to harp on things done? Beeching was not wrong. Britain needed a big axe on the coal industry and the railways both which were losing millions in inefficiency and a great many injuries and deaths. So because of the success of the car (and at that time the British car industry - which was later to shoot itself to death painfully) - we now need trains. But not the trains of steam and pollution and slow services - we need the fast trains clean trains and they would not go on those old tracks - so why complain about the cost of "restoring" - it is not restoring it is catching up and replacing. I loved the old stream trains - but that's just sentimental, I can go to York and see lots of them and love them. There is no place in industry for ineffective, outdates, polluting, financial behemoths - hence the demise of much of British Industry. Sad, but business is - or should be - run on profit or loss. In Cork we still see many remnants of the old British train lines which were closed after Ireland became independent. I was told that the British built them with a view to looking 100 years into the future and that it was very short sighted of those in the then recently formed Irish Government to remove them. They were removed, possibly for same economic reasons that Beeching had in the 60's.However it's very clear that they ought to be re-opened today as road traffic has reached crazy levels everywhere.